We were driving along the stretch of Highway 17 that connects I-95 to Charleston, marshland and palmettos flying by in a green/brown blur, and I was struck by a simple thought that I'd never really articulated before: I love the South. We had just left the touristy little shop called the Caroline Cider Company that you see on either side of the highway heading on or off of the interstate. The store itself didn't really interest me all that much as I am not a man who much loves fruit juices, cider or otherwise. They did have lots of other more traditional Southern goods available though: corn meal, local honey, a syrup made from roasted pecans. My wife enjoys these sorts of places and while she was poking around, I decided to get some breakfast. I had hoped to find some kind of hand pie, but was disappointed on that front. However, they did have a nice steaming pot of boiled peanuts, or goober peas if you will. I went with the "cajun" style to wake me up a little bit. Ole boy gave me an extra bag for my shells too, without me even asking. That's quality service. As I was paying for my goobers, my wife walked up and placed a jar full of darkness on the counter. The label read "Sorghum Molasses." She had been inspired lately by the idea of additive free, natural sweeteners and she wanted to try something other than honey. I am normally averse to buying things at specialty shops, but sorghum isn't something you see everyday and I figured it was worth the premium. This turned out to be a very good decision as you'll see. I'd never heard sorghum syrup referred to as "molasses", but since they are both produced from grasses, I suppose it fits well enough. The taste of sorghum though for me is far more pleasant. This is the jar after I drank a few gulps straight. When we would have pancakes or waffles growing up at my Grandparent's farm, there would always be molasses or cane syrup on the table in addition to the maple (fake) and honey (always Tupelo). My father loved molasses, and I've tried all through my life to find an appreciation for it. I eventually came to love cane syrup, but molasses to me still tastes exactly like the byproduct that it is. We never had sorghum that I can remember, and I've only had the pleasure of discovering it later in life. I must say, it deserves a space in everyone's pantry because it really does find a nice balance between the mustiness of molasses and the rich sweetness of regular cane syrup. We continued on to Charleston where we had some boring immigration business to attend to. The whole affair was a two hour drive for a ten minute errand, but we are always happy to be able to take advantage of any and every excuse to visit the Holy City (even if that excuse is simply that we want a decent burger.) I'll relate more Charleston specific details in a later post--really everything in that city has been written up many times over, not that I'll be deterred from adding my two cents--so I'll skip to the next morning, a Saturday. We were staying in West Ashley (west of the Ashely River...get it?) and really didn't feel like driving back onto the peninsula to eat, but at the same time we weren't about to drive home without filling our bellies from Charleston's bounty on last time. Fortunately, staying out there gave us the opportunity to finally try a spot we see every time we drive into town--The Glass Onion. Even more fortuitously, they offer brunch on Saturday instead of Sunday. I'm shellfish of those pun skills. I knew that the Glass Onion ranked on the Eater 38 for Chucktown, but I had no idea how much national attention they had received until I saw all of their framed publicity on their walls. You know you've made it when you've got the Mayor of Flavortown forever memorizliaed in crayon and butcher paper on your wall. Suffice to say, they deserve all the love (or, whatever is was they got from Guy). Every single thing we ate was magnificent, and the girls taking care of us were (like most people in the area) absolutely wonderful not only as servers but as human beings. My wife got an amazing fritatta piled high with fresh, local squash and butter beans. The eggs were soft and luxurious, the veggies tastier than they had any right to be, and it was huge. Better still was the side of glazed, roasted sweet potato hash. These potatoes were, and I know I use this phrase a lot, like nature's candy. They were so insanely addicting I wasn't sure I would be able to focus on anything else the table. Fritatta and sweet potato hash. When we first sat down, my eyes had been immediately drawn to one thing on the menu and all else faded into a blur: fried quail. I am a man who loves poultry with a passion that borders on obsession, and the more obscure the bird the better (though nothing beats a perfectly roasted or fried chicken quarter.) Quail is not on nearly as many menus and dinner tables as it should be, in my humble opinion. Sure, it has a game association, as quail hunting is a sport enjoyed throughout the South, but these days they are farmed as well. The single best anything that I ate during my many years trapped in Atlanta was a lightly smoked, sorghum glazed quail prepared at recent James Beard award-winner Stephen Satterfield's Miller Union. This was a South Carolina quail that was bathed in buttermilk and then deep fried. It came with eggs and I chose grits as well (also locally produced by Geechie Boy Mill.) Fried quail, eggs, and grits is a Southern breakfast that should be on a flag waving from Charleston's city hall. My bird that morning, like everything else in fact, was perfect. It was partially de-boned as well so I was able to chomp on the whole bird with wild abandon. The grits were done up in a very thick and creamy preparation (yellow corn meal, interestingly) that my mother makes at home and calls "Edisto grits" named for the Island nearby. When I asked for some hot sauce, I was given the option of something called Red Clay, which is a local hot sauce that, and I'm not exaggerating here, beats every other commercially available hot sauce with a baseball bat of flavor like the Bear Jew going to town on that Nazi officer in Inglorious Basterds. Inspired by Guy's horrific portrait, my wife left behind a simpler, dare I say classier memento of our visit. 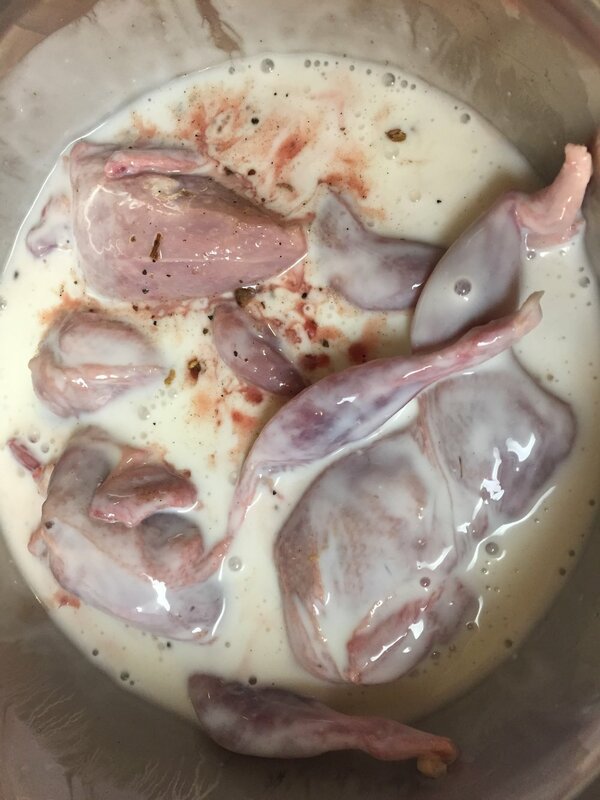 I was so inspired by our experience on that trip that when we returned home and I chanced upon quail (frozen, and in a box, but still quail) at our local supermarket, I snatched them up and got to work. 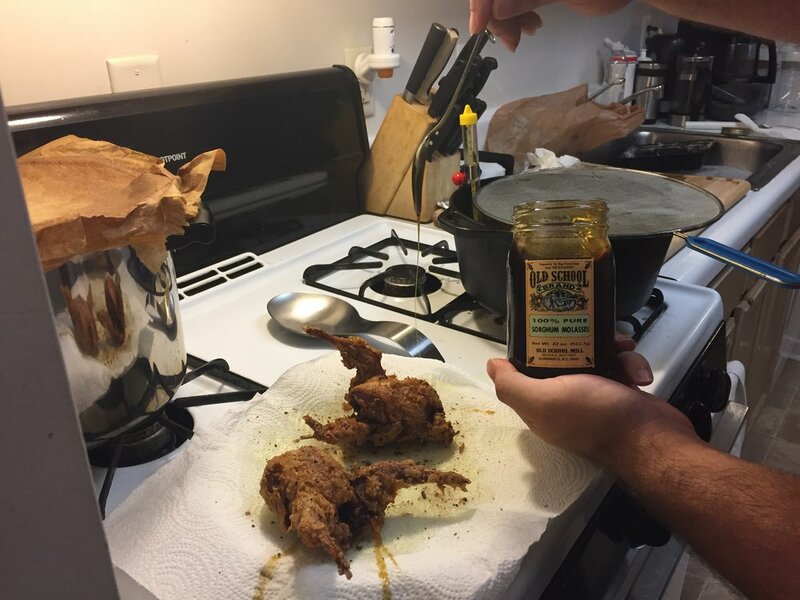 I flipped through a few of my cookbooks and sought suggestions from other Southern-minded cooks and came up with a Chef Ed Lee inspired Asian take on deep fried quail. I somehow managed to find Szechuan peppercorns and what I think is Chinese five spice powder (it just says "cooking spice" on the jar) at our sensory-assaulting "Chinatown" market in Savannah. I ground those up into kosher salt to make what Chef Lee calls "aromatic salt." I then seasoned the quail and the flour dredge with the spiced salt. I also added some paprika to the dredge for sweetness and color.